Safety is a critical component of any higher education campus, and a key part of safety is having the right information about an emergency. Leveraging tools and practices that keep the right people informed at the right time go a long way toward enhancing safety and security in colleges and universities. 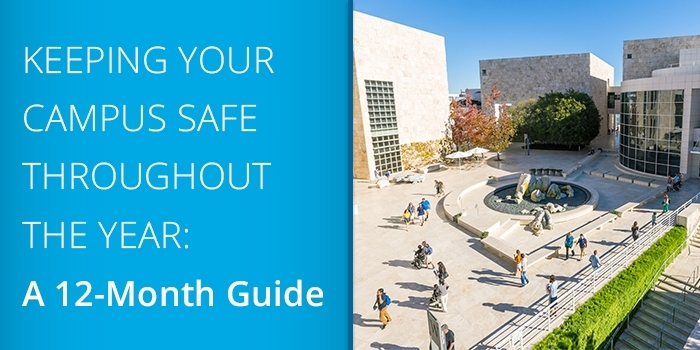 In our latest eBook,"Keeping Your Campus Safe Throughout the Year: A 12-Month Guide,” provides a year-long plan for college and university campuses to prepare for events like severe weather and active shooters. It offers tips for ways to better communicate critical information and recommendations and guidance for what kind of capabilities to look for in mass notification technology solutions. If you’re interested in learning more about how emergency notification can help your higher education institution with communication and safety visit Singlewire at booth 548 during the EDUCAUSE conference Oct. 31–Nov. 3 in Philadelphia. You’ll be to get a hands-on demonstration of how our emergency notification works and how it can be leveraged on your campus.